Generators for RVs are necessary to enjoy lighting, appliances, electronics and entertainment inside and outside the RV. Some RVs have built-in generators to allow you to enjoy all these things right from the start, but other RV owners will need to buy a generator separately. The benefit of a portable generator, however, is being able to carry it and for some model, have it connect to another generator for more power and load capacity. In this review, we will show you to five great generators for RVs from top brands like Honda, Westinghouse and Champion. Each generator has great features as well as that one nagging issue that it needed to improve on. At the end of our review, we will declare the best generator for your RV. Can run in cold weather. Champion offers this high-end generator that is made primarily for RVs. Once connected to your RV’s power supply, it can be used as soon as possible. It has two AC ports and one USB port. This generator allows 3100 watts for the load to start and 2800 to run in an ongoing manner. It comes with a fuel conservation mode in addition to running exclusively on clean power, so sensitive devices are a go. The fuel economy mode allows the generator to work quietly, extend the engine’s life and conserve fuel in the generator’s tank. Included with Champion’s generator is a wireless remote control. You can turn the generator on and off with the push of a button and not need to walk over to the machine itself. The remote control works from an amazingly long distance; from a whopping 80 feet away. This means that you can work and play from as far away from the generator as possible and still turn it on and off by using the remote. Despite the size and power of this generator, it produces as quiet of noise as possible: 58 decibels. This is even quieter than a light conversation among friends. Do not expect performance to dip if it is placed in colder weather. It will work just fine and it will power up as fast as it ever would. This generator is heavy, weighing almost 100 pounds. It does have a set of wheels, however, these wheels are too deeply set. With that said, maneuvering and wheeling this generator over slopes can be challenging. Has a high capacity for loads. Wheels are not designed optimally. Westinghouse provides us with the final generator of this review. This one is a low-power, cost efficient model in their vast line of products. It has two 12-volt ports. With its parallel port, you can combine your generator with another Westinghouse generator, not just an iGen1200 and add more power and load capacity. If you aren’t ready to take a big plunge with an expensive generator, buy this one now and get another one later. This is the quietest generator at just 52 decibels. It is also the lightest generator at just 35 pounds. If you prioritize your choice in the quietest or lightest generator, you cannot go wrong with the iGen1200. This is a fuel-efficient generator that also runs on clean power only. If you have sensitive electronic devices, you won’t need to worry about triggering a problem. The downside is that with less money, you get less power and load capacity. Even if you have enough room for all of your electrical needs, it won’t take long before the power runs out, we’re afraid. The bright side is that you can always buy another in the future. Does not cost much money. Can be connected to another generator. Can shut off instantly when problem arises. Honda offers this spiffy and lightweight portable generator. It is made for being easy to use and fully-functional. It has two AC ports and one 12-volt port. A parallel port is also included, allowing you to connect another EU2000I generator for double the capacity and power. This generator allows 2000 watts for the load to start and 1600 to run in an ongoing manner. It comes with a fuel conservation mode in addition to running exclusively on clean power, so sensitive devices are a go. The Honda generator will shut itself off when it runs out of oil, this will prevent a catastrophe from happening. You will need to give it more oil before you turn it on again. This is a lightweight generator, weighing at just 45 pounds. It is easy to carry and store. While we do not have an official decibel reading for how quiet this generator is, we can confirm that it runs very quietly; but only slightly quieter than the Champion generator. This is an extremely expensive generator. While what it offers is great, we do not feel that you should pay that much to get it all. Yamaha is the maker of this next high-end generator. It has two AC ports and one 12-volt port. This generator allows 2400 watts for the load to start and 2000 to run in an ongoing manner. It comes with a fuel conservation mode in addition to running exclusively on clean power, so sensitive devices are a go. This is another heavy and expensive model. Even though it is made to be as compact as possible, it can be too heavy to carry on one’s own. There are two handles on each side of the generator, so the idea is for two people to carry it. This generator can keep working even if it reaches temperatures up to 110 degrees. It something were to go wrong, like it running out of oil, it will automatically shut down. This is sure to last a long time, thanks to the cast-iron cylinder liner. The liner is made to prolong the life of the engine and ensure fewer problems the longer you own it. The fuel gauge allows you to see exactly how much fuel is left without having to take any wild guesses. A lot of this generator is exposed in the back. We fear that is somebody were to kick it accidentally, that it would turn off and never come back on. This generator from Briggs and Straton is considered a basic version of their PowerSmart generators, but still comes with a lot of potential. It has two AC ports, one USB port and one 12-volt port. A parallel port is also included, allowing you to connect another PowerSmart generator for double the capacity and power. This generator allows 2200 watts for the load to start and 1700 to run in an ongoing manner. It comes with a fuel conservation mode in addition to running exclusively on clean power, so sensitive devices are a go. Like the Honda generator, this generator is meant to be light and easy to carry, although this one is several pounds heavier. It has a handle so that you can easily grip it and pick it up. According to Briggs and Stratton, it makes less than three percent total harmonic distortion, which is okay for electronics such as laptops and game consoles. For a little bit more weight, you get to pay just about half of the cost of the Honda generator. This is a quiet generator that produces up to 60 decibels, which is as loud as a full-sized air conditioner. The load specs really match up with that of the Champion generator; 8 hours at a 25-percent load, making this one a very attractive and tempting generator to get. The 12-volt port lacks in usefulness, to be frank. When we used this generator to charge a 12-volt battery, it did so at an awfully slow rate. 12-volt port is very slow. 1. Does it have enough power to run all of your electronics without completely draining the gas supply that you have available? This answer ultimately depends on the wattage of your generator, the capacity of the fuel tank and the size of your load, but most generators should be able to power all your electronics for a period of time. At a 100% full load, you should get enough power for a couple of hours. For a 50% load, you should have enough power for four hours. 2. How do I connect a generator to my RV? Whether you are buying a generator that is compatible with RVs or not, any generator that is not can always be hooked up to an RV using a special adapter sold separately. You will need to buy a 30-amp power cord or a similar product according to your RV’s inlet that would connect to the generator. Power cords have either three or four prongs, and if your inlet has the same number of holes, the connection will fit. 3. How much power can I generate? For most generators, the power that you can generate depends on the load that you have connected to it. These generators should not waste load, and all the power and energy it has should go towards powering your equipment or devices. The wattage of your generator should indicate what continuous wattage it will accept. FOr instance, the Honda EU2000I can generate 2000 watts of power. Your load, therefore, should not be more than 2000 watts. You can get either buy a portable or permanent generator for your RV. Each type has significant advantages over the other. Portable generators have wheels or handles for that you can carry or move them around from one area to another. Portable generators are more affordable than permanent generators, but they have limits in regards to load capacity and fuel. Do not place a portable generator in a garage, even with doors or windows open. Placing a generator inside a building is detrimental to humans as it could expose them to carbon monoxide poisoning. Keep your portable generator outdoors in an open space that is more than three feet away from anything that could catch on fire. If it is raining outside, provide it with shelter from rain. This generator must entirely be away from doors, windows, vents and crawl spaces. 6. What is the difference between surge watts and running watts? You might notice two types of watts on each generator’s product description: surge watts and running watts. Surge watts provide an additional surge of power to turn the engine on. For instance, the Briggs & Stratton 30651 P2200 generator requires 2200 watts of surge power. As long as it gets this surge, it will turn on and stay on. A surge lasts only a fraction of a second; the moment that you turn the generator on, to be precise. Continuous watts are the most number of watts that the generator can produce at a time. The Briggs & Stratton 30651 P2200 generator can allow up to 1700 watts of power at a time, so it is not capable of powering any load that requires more wattage than 1700. 7. What type of fuel is ideal for RV generator? Generators can be powered from one of many different types of fuel. These fuel types include gasoline, diesel, bio-diesel, emulsified diesel, natural gasoline and propane. Depending on the generator you but, there may only be one or two different types of fuel that it can take. Unleaded gasoline is recommended for many types of generators. Generators usually have better performance and clean and safe operation with gas that contains up to 10 percent ethanol. Diesel is the fuel type of choice for larger and more powerful generators. Diesel, however, is the most affordable and least flammable of fuel choices. Propane is a very flammable fuel, but it can last a very long time. Propane ensure quieter operation than most fuel types, but propane usually costs more money than other types of fuel. Natural gas is a gas that is cheap and readily available. This type of gas, however, is depleted the fastest inside of a fuel tank. If looking to conserve fuel is a priority, then natural gas is not the best choice for you. 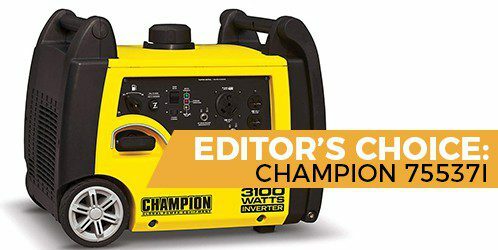 After careful deliberation, we find that the Champion 3100-Watt RV Ready Portable Inverter Generator is the generator that is most worth your investment. While it is a pretty pricey generator, it simply does what you need it do do, in addition to giving you more useful features and more room for all of your supplies and electronics. We easily feel that this generator gives you the most bang for your buck. If you have the money for Champion’s generator, you’d easily be satisfied with your purchase. The runner-up in this review is the Westinghouse iGen1200 Super Quiet Portable Inverter Generator. For the budget conscious owner that is looking for value, you cannot go wrong with the iGen1200.